Considering that it’s America’s 14th-largest city, Indianapolis has some surprises. “We have horse farms in Marion County,” which shares the city’s boundaries, noted Kim Irwin of the Indiana Citizens’ Alliance for Transit. A far higher share of households live in single-family homes — 67 percent — than in Midwest cities like Columbus (56 percent) or Milwaukee (46 percent). At the same time, Indianapolis has a dense downtown, featuring the Indiana statehouse and several major employers, where bus service could be much more useful if it were structured better. 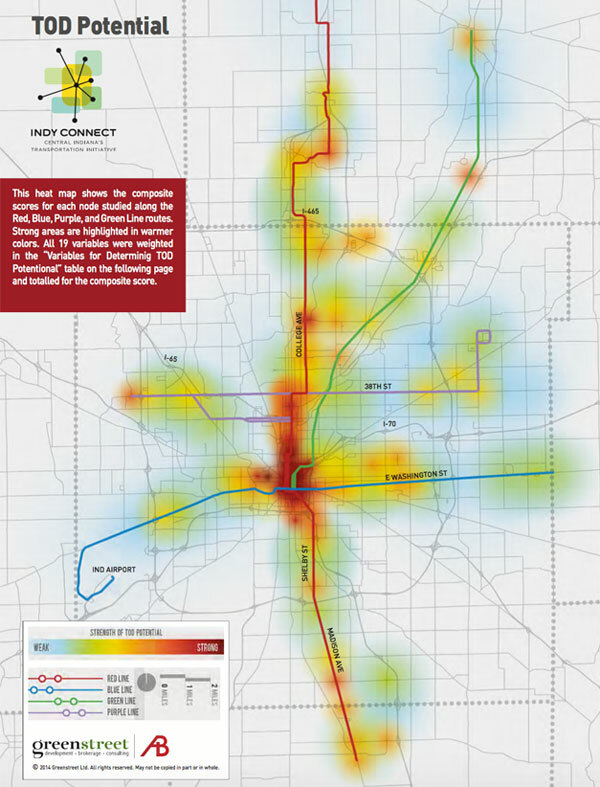 As I noted in the previous Getting Transit Right post on Indianapolis, the city has a lot of catching up to do. Transit service is scarce and very few people use the existing system. A key reason for these lackluster outcomes is the city’s sprawling pattern of development. In this post, I’ll explore how the city’s built environment has shaped its ability to make transit work effectively. I’ll also investigate how the city plans to orchestrate new development around its planned transit investments. 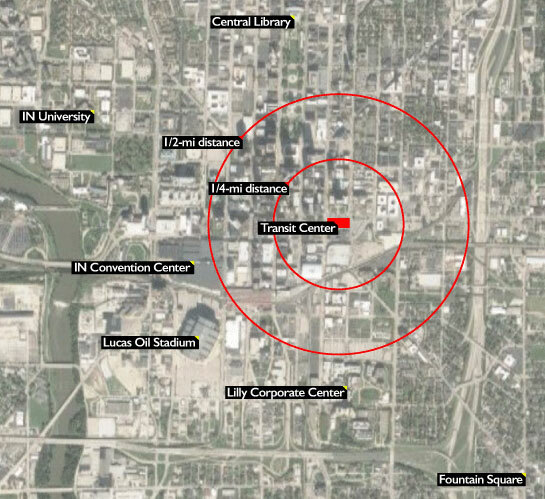 Indianapolis features a heavy concentration of jobs downtown largely within the backwards-C-shaped loop around the central area. 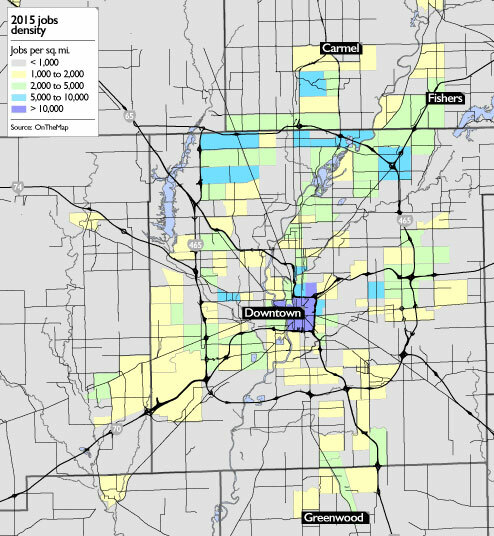 The density of jobs works to Indianapolis’s advantage, since small transit networks thrive most when service is concentrated on a central area. That’s particularly true because downtown is the place where the greatest number of residents can get to most easily, because of its geographic centrality. Nevertheless, as the following map shows, the city also features significant job clusters far from downtown along the northern portion of the 465 loop highway. These jobs are harder to provide transit service to, since they’re in a car-dominated environment and far from downtown. Meanwhile, the population of Indianapolis is very spread out, as the following map shows. Though there are pockets of moderately-dense neighborhoods, there are no neighborhoods with more than 10,000 people per square mile, which is the typical benchmark to support rail transit. The population of Indianapolis’s built-up areas has actually steadily declined over time. Most neighborhoods near the center lost residents between 2000 and 2010. In the neighborhoods that were already built up in 1960, Indianapolis lost more than 200,000 people by 2014, according to my calculations. This was the second-largest percentage drop among the nation’s 20 largest cities. At the far southwest and southeast edges of Indianapolis, some areas are literally rural. That makes extending service everywhere within the bounds of the city problematic. Someone taking a bus from the north side of town and attempting to get to the Lilly headquarters must either wait to transfer to another bus or go for hike. The same goes for trips in the opposite direction, like someone riding from the south to get to the central library. No wonder, then, that downtown Indianapolis is so rife with parking. The Lilly headquarters and Lucas Oil Stadium, for example, are surrounded by vast acres of asphalt. The parking itself generates car trips, but the transit network also needs to be restructured to provide frequent, direct crosstown service. Better transit service patterns can support more walkable development, and vice versa. Developers are buying into the idea that they should invest in housing that complements transit. Matt Impink of the Indy Chamber noted that “many partners are seeing where key opportunities are available to promote denser development along the line.” Milhaus Development, for one, has compact housing under construction along the north side of the city. And along East Washington Street, in a historically underinvested neighborhood, the community has laid the groundwork for future walkable development along a rapid bus route. Indianapolis is one of the most sprawling regions in the country, and its low densities make effective transit difficult to provide. Looking ahead, there’s cause for optimism, with the city and regional agencies developing plans to encourage transit-oriented development. Low residential and employment densities make providing effective transit service difficult. Many suburban job centers are auto-oriented and far from transit. Center-city destinations are not well-served by transit service radiating from a single hub. High levels of cheap or free parking downtown encourage car commuting. Indianapolis has been busy adapting its zoning code to encourage more mixed-use, low-parking development. Developers are responding with projects to meet a growing demand to live in walkable neighborhoods. In the next post in the Getting Transit Right series, we’ll explore recent changes in the Indianapolis transit system, with a specific focus on how the region has worked to connect suburban job centers to the bus network. you cannot serve the suburbs with transit that is affordable to the public. Once we start to understand that suburbs no longer serve us, then we have to stop limping along with the cities we have, and build the cities we need – those that work well WITH transit. Interestingly, the transit center is new and replaced a not-very-functional “bus rodeo” loop through downtown that better served several of the destinations you highlighted as currently underserved. One potential fix would be a super-frequent (5 minutes) downtown circulator at morning and evening peaks. I agree with you in theory…density is good. However, that plan does not work so well when many jobs are in the suburbs and potential employees without cars are in the city. Indianapolis has numerous warehouse/logisitics companies on the edge of the city that are always hiring. These are massive operations that are not going to be located in the central city. Public transit does need to get potential employees from the city to these jobs. Refusing to provide service to these individuals benefits no one. A reliable, comfortable, clean system will work in Indianapolis. It would be better if we would utilize a more popular technology. Our system started to decline in 1946 and finnally went broke in the late 50’s. Development patterns became irrational and sprawl began. At one point we had over 12 light rail lines and 14 electric bus lines. The entire system was 85% electric. Public transit was considered a buisiness and not a necessary public service so the decline was inevitable. If we are to make our city a place that people want to live we must start with a public transit system that is popular. There are many different ways for a city to get people to where they need to be. As long as the city is taking it on as their responsibility, and does not simply rely on condemning people to drive. Sometimes, transit will do the job – and sometimes, we simply will need to build a different city that works better with fewer cars. I’m curious as to what you mean by “popular.” Would you care to clarify? IndyGo had several downtown circulators at one point (dubbed the Red and Blue Lines) but both were discontinued as a result of low ridership. I’m a fan of their grid design, which would serve two markets within the downtown area (intra-Downtown and inter-neighborhood). Could anyone offer examples of functional bus circulators in other cities and in what context they are able to sustain ridership? Are loops inherently unattractive to potential riders (even on free routes)? Can marketing of several routes along one street (or loop) as one more frequent bus line encourage more ridership (ie. Chicago’s Loop Link)? I lived in an apartment community on the west side of the 465 loop halfway between Rockville Rd and 10th St. There are many low-moderate income apartments in this area and amazingly no sidewalk along the service road to either Rockville or 10th to catch the bus. The IndyStar recently covered the issues of lack of sidewalks, I found that to be a bigger deterrent to taking the bus downtown moreso than the downtown network. Southbank Shuttle between Cincinnati, Covington and Newport. $1 fare, 5,000 avg. daily riders on one of those hokey trolleys. The vast majority of the US population lives in suburbs. Most urban areas have far larger suburban populations than those in city limits. And, not all suburbs are simply new homes in former fields, some are very densely populated and even more densely populated than the core city nearby. 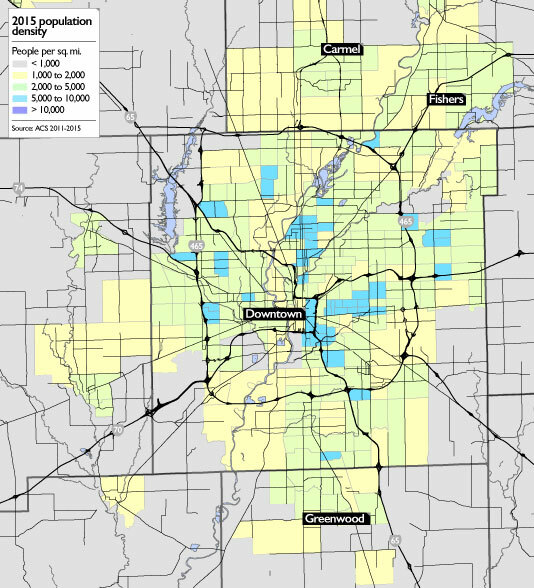 Indy is unique because of its set up in unigov, but in essence is really a much smaller “city” with former suburbs and even rural areas now in “city limits”. So while it might be an issue for Indy specifically, there are countless examples of highly used public transit options in suburbs. And look no further than northern Indiana where ridership is up on the South Shore trains and plans studied to expand to other (suburban) communities eager for commuting options. Regional approaches where it isn’t a “either or” are best. Suburban transit users in NY/NJ, VA/MD, Metro Chicago, Bay Area, Philly, and other areas count in the millions daily and is accepted norm, not to mention as a way for those in cities to get to jobs often not in city core…agree transit for sprawl or building further out for no good reason is silly, but Indy unique as it has a semi-rural density in many parts and no direct suburban connections already in place line rail…..